Asia, undoubtedly is a highly potential video streaming market. As with the booming technology and the internet penetration of 40.2%, it has peaked in $2,490 million revenue for the year 2016 and is expected to touch US $5,017 million by 2020. 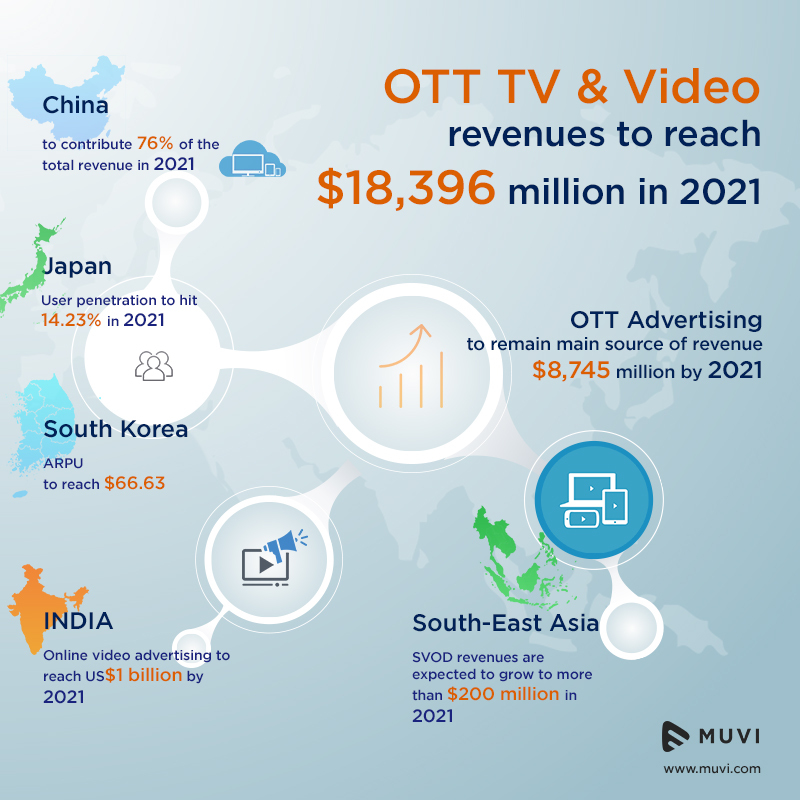 Let’s take a look deeper into the future of OTT TV and Video streaming business in Asia. According to a study by Statistica, the percentage of internet users who watched online video content on any device was pretty high in Asian countries namely South Korea 95.9%, China 89.6%, India 84.1% and Japan 73.6%. No doubt, online video consumption is one of the most popular internet activities worldwide. Internet penetration in Asia was about 40.2% in 2015 which indicates that the user engagement provides wide space for video streaming businesses to grow. The value of online video sector in Asia Pacific is set to swell from an estimated $13 billion this year to $35 billion by 2021. This is a growth rate of 22%, according to regional media consultancy Media Partners Asia. 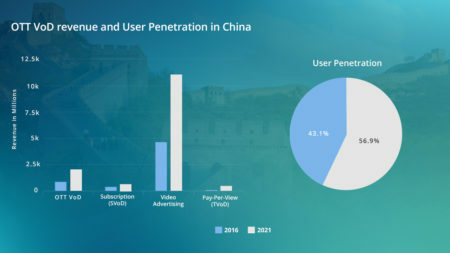 The online subscription video-on-demand (SVoD) segment, MPA expects total paying customers to grow from US $177 million in 2016 to US $360 million by 2021, with China representing the majority share. SVoD revenues are expected to reach US $13 billion by 2021, a 28% CAGR from US $3.7 billion in 2016. China will again contribute the majority, representing more than 80% by 2021. Online video advertising sales will reach approximately $22 billion by 2021 versus $9 billion in 2016, with a 19% CAGR. China will represent more than 70% of the online video advertising pie by 2021. This will also help online video advertising to grow as a proportion of Asia Pacific digital ad spend from less than 15% in 2015 to 22% by 2021. Asia Pacific’s fixed broadband subs will reach 345 million in 2016, and grow to 425 million by 2021. Average broadband household penetration will grow from 35% in 2016 to 41% in 2021. Mobile broadband to reach 79% of the Asia Pacific population by 2021, versus 46% in 2016. There is no doubt that mobility has played a crucial role in contributing towards online video consumption and has also made it easier for viewers to go online and access content. Video consumption largely depends upon the device adoption and viewing habits that actually differ from region to region. Let’s take a closer look at each region/country and understand trends, behavior and what the video streaming market outlook looks like for them. Video streaming is exponential in South Korea. For example they have this interesting and popular streaming platform called AfreecaTV that caters to solo diners and enables them to watch live streams of jockeys eating in front of their own cameras. These jockeys then stick to these solo diners and appeal to the increasing number of solo diners in the country! As per stats, the overall revenue in “Video-on-Demand” segment in South Korea amounts to US $324.6 million in 2016 and this revenue is expected to show an annual growth rate (CAGR 2016-2020) of 25.17% resulting in a market volume of US $796.7 million in 2020. The user penetration itself is at 12.93% in 2016 and is expected to hit 25.34% in 2020. 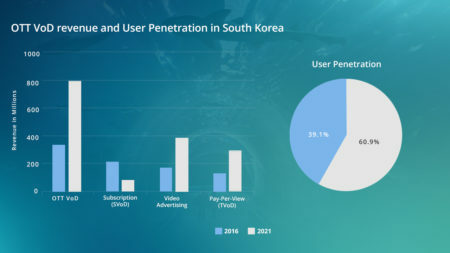 With the ARPU currently amounting to US $57.44 / user and overall internet penetration at 85.7%, maturity of the South Korean video streaming market is quite evident. A survey by Statista found that male online users between the age group of 15 and 24 spent 4,229.8 minutes on online videos per month. Japan by far is the leader in Online Video in Asia and its overall revenue from the “Video-on-Demand” segment amounts to US $611.1 million in 2016, which is expected to show an annual growth rate (CAGR 2016-2020) of 24.69% resulting in market volume of US $1,477.1 million in 2020. 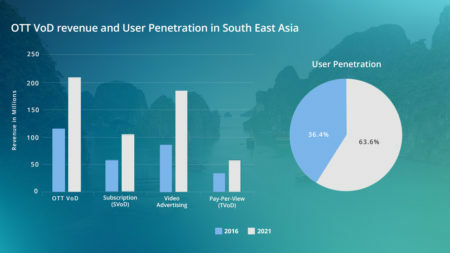 The overall user penetration is noted at 14.95% in 2016 and is expected to hit 19.21% in 2020 with an average ARPU of US $19.21 / user (Source). The overall internet penetration in Japan is at 91.1% indicating that Japan is slowly but steadily growing bigger when it comes to the video streaming industry. Southeast Asia is the next big destination for video streaming services. Hollywood studios are proposing major tie ups with streaming start-ups in South East Asia, which would certainly result in their audiences increasing radically. Influx, which is available in Philippines and Thailand with Indonesia, Sri Lanka and Vietnam queued up for launches. Another leading VOD Platform in Asia is HOOQ, a joint venture between Warner, Sony and Singtel group. HOOQ was launched in January of 2015, and has been live in various markets since March 2015, such as the Philippines, Thailand, Indonesia and India. HOOQ is already the #1 paid video OTT service in Philippines with over 100,000 paying subscribers. It has also been making inroads in all markets it has launched with its partnerships either with studios or with Telco’s to bring the platform and huge library of regional + Hollywood content to its subscribers. The overall revenue in Video on Demand segment amounts to US $395.1 million in 2016, which is expected to show an average annual growth rate (CAGR 2016-2020) of 13.60% resulting in US $645.90 million market volume in 2020. The average user penetration (consuming streaming video) in the region is noted 8.60% with an average revenue per user (ARPU) of US $19.60/user in 2016 and is expected to hit 15.20% by 2020. 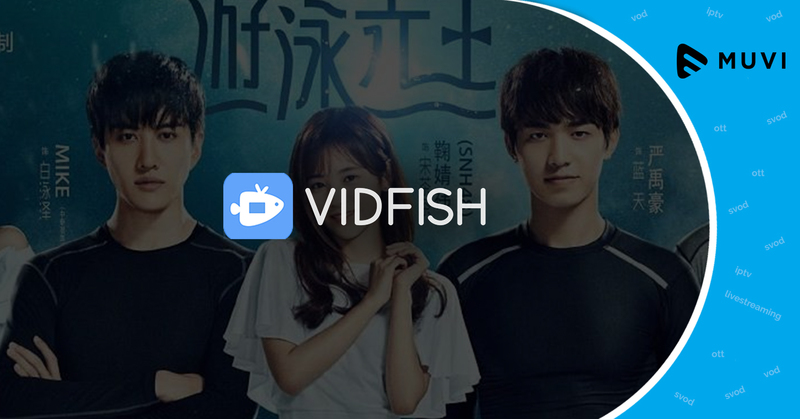 Video streaming has taken over the China market in the last decade. The penetration rate of online video use in China until December 2015 was 73.7%. According to a survey by Tencent, 90% of users surveyed watched some form of online video on their Mobile devices in the last 3 months. Recently, Hong Kong Broadcasting Network (HKBN) and TVB formed a partnership to bundle broadband + content via its offering – myTV SUPER, allowing their customers to watch all their favorite programs at home on big screen and on-the-go via mobile devices. This offering is being rolled out to 400,000 Households in 18 Months and is expected to reach 1 Million total broadband subscribers Within 2 Years. The overall revenue in the Video on Demand segment amounts to US $895 million in 2016, and is expected to show an average annual growth rate (CAGR 2016-2020) of 16.08% resulting in a market volume of US $1,624.90 million in 2020. The average user penetration (consuming streaming video) in the region in 2016 is at 5.21% with the average revenue per user (ARPU) of US $15.70/user, which is expected to hit 8.52% in 2020. With the overall internet penetration of just 52.2%, China is expected to invest about $22 billion by 2020 to expand broadband internet in remote and underserved parts of the country. More than 20 million households will gain better internet services as part of the plan. The plan covers 98% the country’s villages and includes 50,000 villages that currently do not have access to broadband. This surely makes the future look very promising for video streaming in China, indicating a huge market China is going to be. With Netflix’s entry early this year and Amazon Prime too making a come in the Indian market, video streaming scenario has changed drastically in last couple of years. India is the market where the consumer is spoilt for choices. Indian Entertainment industry is known to be the world’s biggest content producer (Movies, TV Shows, Short Format, Sports, News, etc.) and due to this, there are many big and small Video Streaming Platforms catering to each and every need. From broad based platforms like HotStar which is run by Star India, one of the biggest Broadcasters in India, comprising of Movies, TV Shows, Live Sports Streaming, as well as original content produced by themselves, to niche platforms like Cineplay, which is an On-demand platform for Theatre content, Indian consumer has multiple options of choosing a platform catering to their needs. The overall revenue in the Video on Demand segment amounts to US $213.8 million in 2016, and is expected to show an average annual growth rate (CAGR 2016-2020) of 16.84% resulting in a market volume of US $398.4 million in 2020. The average user penetration (consuming streaming video) in the region is 3.51% with an average revenue per user (ARPU) of US $6.53/user in 2016 and the penetration to hit 6.19% in 2020. It’s also not about just choices, the Indian consumer is also spoilt when it comes to pricing and just as India saw a telecom war on voice and data pricing, there is a similar battle going on for digital content and there is just one clear winner. India’s 1.2 Billion+ strong population, which sees a mobile penetration ratio of over 80% and internet penetration of just under 35%, clearly indicating the huge scope, gap and potential that is up for grabs for the right provider! Video streaming is definitely taking Asia by storm. With the whole of Asia combined, it’s already the biggest population of online internet users in the world and this is just with an average internet penetration of about 40.2%. 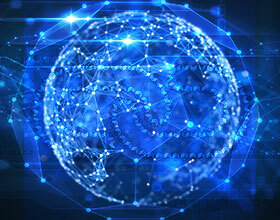 The potential to grow in this market is substantial, in terms of both users as well as revenue, and it seems like global as well as regional players are gearing up for this battle. The winner is clearly going to be the end consumer who will have choices in platform, content and price point to go with. Global players like Netflix and Amazon Prime, will need to acquire a lot of local flavour to tap into this market. Global Players may bank on their heavy Hollywood library and content that they bring to this region, which typically a regional player doesn’t have good access to, but a regional player is well in-tune with the market’s expectations and content their audience is looking for and has the flexibility of setting a price point without having to worry too much about maintaining a “global pricing balance”.